With new materials to sort, transfer and rearrange, with water to be poured, spilled and cleaned up, with tables to be scrubbed, fun and learning go hand in hand. The sensorial experience was enriched by touching and feeling various textures of the rocks. Several collections of rocks and minerals were available for comparing, sorting, and matching by color, shape, size, and weight. Sound lessons advance along with the children’s ability to recognize beginning sounds/letters. The rhyming and word games engage more and more participants. Some of the intermediate children started writing with the movable alphabet. Favorite books on this topic: “Sylvester and the Magic Pebble” by William Steig, “If Kisses Were Colors” by Janet Lawler, “Never Too Little to Love” by Jeanne Willis and Jan Fearnley, “Varenka” by Bernadette. This month we worked with counters made of ruby-like glass hearts, shiny polished pebbles or fuzzy teddy bears. That made the point of interest to shift heavily toward the Cards and Counters lesson, and now we have more children who know how many objects they need for each number. 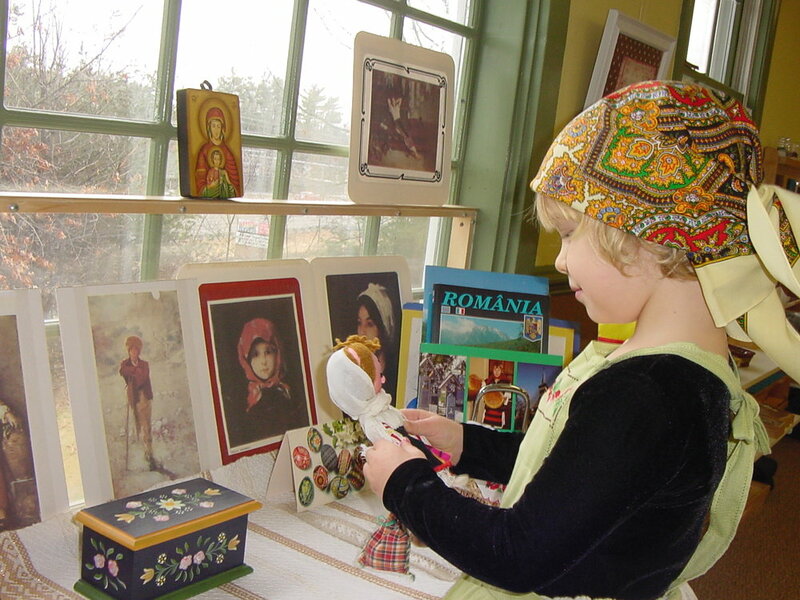 Romanian artifacts, folk costumes, music, stories and snacks were a good start for our trip to Europe.We will continue in March with Italy, Spain, France, Germany, United Kingdom, Ukraine and Russia. The topic of this month was very popular, and the children surpassed our expectations in the interest they showed, the keen observations they made, the accurate matches of the rocks with the pictures from books, the facts they knew, and the questions they had. learned that salt, chalk, coal, and sand come from rocks. Reptiles came to us not only from books, but also from Mrs. Carla’s private collection. Floyd is a Russian tortoise that used to live in Ms. Claire's classroom. He is full grown at about 5 inches across. Willie is an African Spurred tortoise which is third largest in the world, she is currently about twice as large as Floyd. She was given to me by a friend and although we like having her, eventually she will need much more space, outdoor space in a warmer environment. Both tortoises eat a diet of dried tortoise food, fresh greens, vegetables and fruit. Kayla and Dontello are baby gargoyle geckos that belong to Anna and her sister Lexi. They enjoy being handled and are very easy to care for. I also talked to the children about our baby veiled chameleon. Unfortunately, chameleons can become stressed easily and I felt it was better not to bring him in at this time. However, we did look at pictures of many different kinds of chameleons in books. Mosaics with little magnetic tiles were the biggest attraction and a great trainer for patience, focus, refining small motor skills and coordination, and developing self control. Paper and glue were also handy for quick projects: crazy hearts, concentric circles for the inner structure of the earth. Music: We had fun singing and moving on Old Saint Helen, a song about the volcanic eruption from 1980. Songs about love and peace are always in big demand. In March we will finish the dinosaurs and continue our geology lessons about erosion as we move into the theme of the next month: weather and changes in nature during spring. Experiments with air and water will be part of our hands on science lessons. Reminders: Spring Parents/Teachers Conferences will run in the afternoons beginning March 12. If you cannot come to school in the time slots offered, you may choose to teleconference. Broken hearts: Addition problems were written on half hearts. After solving the problems the children had to match the equal results, cut and paste the pieces to rebuild the hearts. This activity revealed that addition is commutative, and that there are more ways to make the same number. It was also self-corrective, and the children learned to fix their mistakes. Circles: Spatial relationships: concentric, tangent, and secant. The long cube chains (7, 8, 9 and 10) are taken out more often either as individual attempts or as a team. Age is not a factor when it comes to dedicated work, and the sense of accomplishment makes the efforts worthwhile. Reading has become a favorite activity. The large selection and variety of topics are beaconing with irresistible illustrations and beautiful stories.